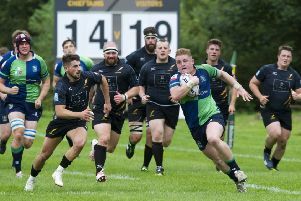 Boroughmuir secured the bonus point after only 28 minutes as they picked up their first win of the Premiership campaign. After four minutes both sides had a man sin-binned, Edinburgh Rugby loosehead prop Darryl Marfo going off for Muir with Hawick back-row Stuart Graham following him. 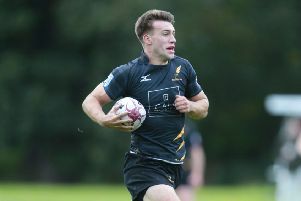 Muir took the lead thanks to an unconverted try by captain Johnny Matthews, then second-row Stuart Smith galloped over with stand-off Tom Wilson converting. The third and fourth tries came from good breaks from their own half by Boroughmuir. First, Kerr Gossman set up fellow winger Jordan Edmunds for the score, then No.8 Rory Drummond broke through to put centre Willie Wardlaw in for the bonus point. Before the break Hawick’s Dalton Redpath went over with captain Ali Weir converting, but Wardlaw, Edmunds, Matthews and Jack Steele all touched down for Muir in the first 20 minutes of the second half, before Edmunds and Matthews completed their hat-tricks and Rory Arthur rounded things off at 63-7.